Introduction: To compare electronic apex locators (EAL) with others root canal determination techniques and evaluate other usage of this devices. 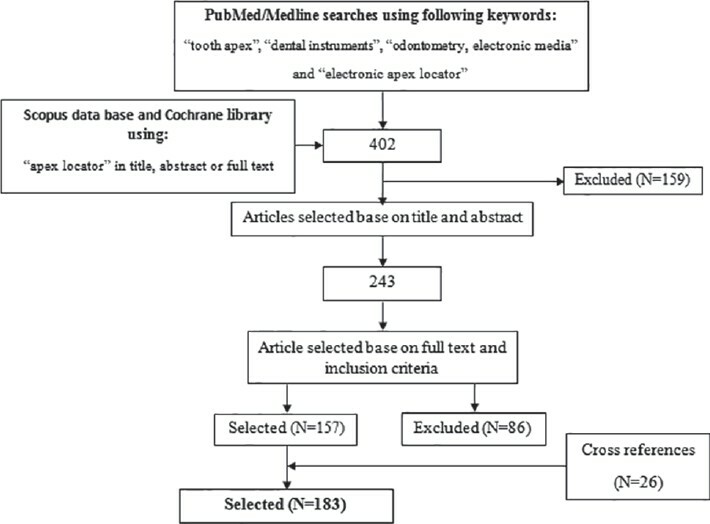 Materials and Methods: "Tooth apex," "Dental instrument," "Odontometry," "Electronic medical," and "Electronic apex locator" were searched as primary identifiers via Medline/PubMed, Cochrane library, and Scopus data base up to 30 July 2013. Original articles that fulfilled the inclusion criteria were selected and reviewed. Results: Out of 402 relevant studies, 183 were selected based on the inclusion criteria. In this part, 108 studies are presented. Under the same conditions, no significant differences could be seen between different EALs of one generation. The application of EALs can result in lower patient radiation exposure, exact diagnosing of fractures, less perforation, and better retreatment. 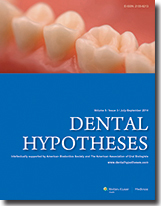 Conclusions: EALs were more accurate than other techniques in root canal length determination. Introduction: Orthodontic tooth movement occurs as a consequence of paradental tissue remodeling in response to applied mechanical forces. Retention is a necessary procedure to prevent relapse when orthodontic appliances are removed. Developing new methods to promote stability and retention following orthodontic treatment has always been desired. Recent studies have demonstrated the favorable effects of low magnitude, high frequency (LMHF) mechanical vibration on bone homeostasis through an ability to stimulate cell metabolism and to enhance osteoblast proliferation, osteoblastic gene expression and bone formation. The Hypothesis: In this paper, we propose that LMHF mechanical vibration is a viable adjuvant method to accelerate bone and periodontal tissue remodeling, thereby promoting stability and shortening retention time. Evaluation of the Hypothesis: Much effort has been made to explore therapies to prevent relapse and shorten orthodontic retention time with limited success. LMHF mechanical vibration may be a promising approach to accelerate alveolar bone remodeling, ultimately promote stability and shorten retention time. Introducation: The long-term outcome and clinical results of gaparthroplasty used for the treatment of condylar ankylosis of the mandible in children with application of postoperative activator appliances and costochondral rib graft are evaluated and compared. The purpose of this study was to compare the effect of gap arthroplasty and costochondral graft methods on reankylosis, a mount of mouth opening and growth. Materials and Methods: A non-randomized, retrospective clinical study of l0 cases (5-12 years old) of condylar ankylosis of the mandible, surgically treated during a 10 year period from 2002 to 2012 was performed. Four patients were treated by condylectomy and interpositional flap, whereas six were treated by condylectomy and immediate costachondral rib grafts. The first group underwent long-term postoperative therapy using removable activator appliances. Casts, radiographs, photographs, and computed tomography (CT) were used post surgically to evaluate rib graft, condylar growth and function, occlusion, facial, and condylar symmetry. Data were analyzed by SPSS 16 statistical software using Mann-Whitney, Paired T-test and Chi-square tests. Results: Children with long-standing condylar ankylosis of the mandible treated by condylectomy and interpositional flap showed more favorably when activators were used post-surgically. Conclusions: Gaparthroplasty with functional activator post-operatively can be considering for TMJ ankylosis. 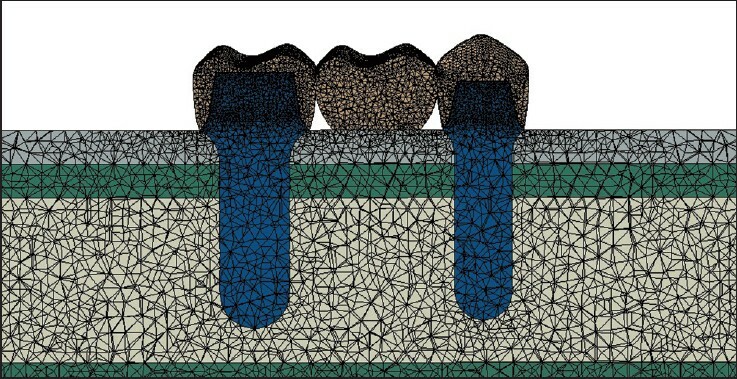 Introduction: In the present study, the finite element method (FEM) was used to investigate the effects of prosthesis material types on stress distribution of the bone surrounding implants and to evaluate stress distribution in three-unit implant-supported fixed dental prosthesis (FDP). 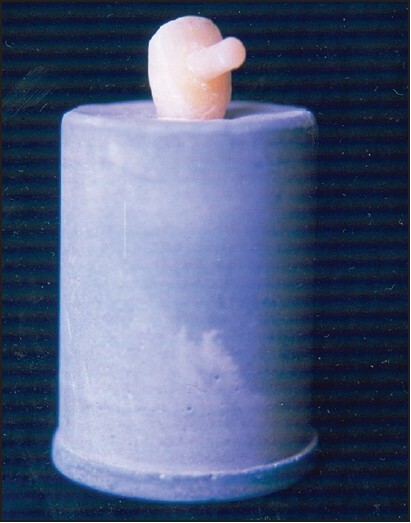 Materials and Methods: A three-dimensional (3D) finite element FDP model of the maxillary second premolar to the second molar was designed. Three load conditions were statically applied on the functional cusps in horizontal (57.0 N), vertical (200.0 N), and oblique (400.0 N, θ = 120°) directions. Four standard framework materials were evaluated: Polymethyl methacrylate (PMMA), base-metal, porcelain fused to metal, andporcelain. Results: The maximum of von Mises stress in the oblique direction was higher than the vertical and horizontal directions in all conditions. In the bone-crestal section, the maximum von Mises stress (53.78 MPa) was observed in PMMA within oblique load. In FDPs, the maximum stress was generated at the connector region in all conditions. Conclusion: A noticeable difference was not observed in the bone stress distribution pattern with different prosthetic materials. Although, higher stress value could be seen in polymethyl methacrylate, all types of prosthesis yielded the same stress distribution pattern in FDP. More clinical studies are needed to evaluate the survival rate of these materials. Introduction: Bleeding from gums is a common feature in periodontitis patient. But abnormal bleeding from the gingiva or other areas of the oral mucosa that is difficult to control is an important clinical sign suggesting a hematological disorder. Case Report: A-40-year old male patient reported to our clinic with the chief complaint of acute gingival bleeding. There was continuous bleeding, fever since 3-4 days with weakness, retro orbital pain, and severe backache. Patient gave a history of bleeding from gums for last 24 hrs. His blood profile revealed; platelet count of 36,000, total wite blood cell (WBC) count of 6000/cumm, differential leukocyte count (DLC) (P45, L53, E2), and hemoglobin 12 g/dL. Patient sera was positive for dengue non-structural protein-1 antigen, anti-dengue immunoglobulin M (IgM), and anti-dengue immunoglobulin G (IgG) antibodies. Discussion: Here is a case report capable of changing our vision that acute gingival bleeding can also occur in dengue fever. Dengue fever can also be considered as one of the differential diagnosis for the acute gingival bleeding. Introduction: Maxillary midline diastema in adults is an esthetic problem that alters the appearance of smile. This paper describes treatment of a large diastema in a middle-aged patient. 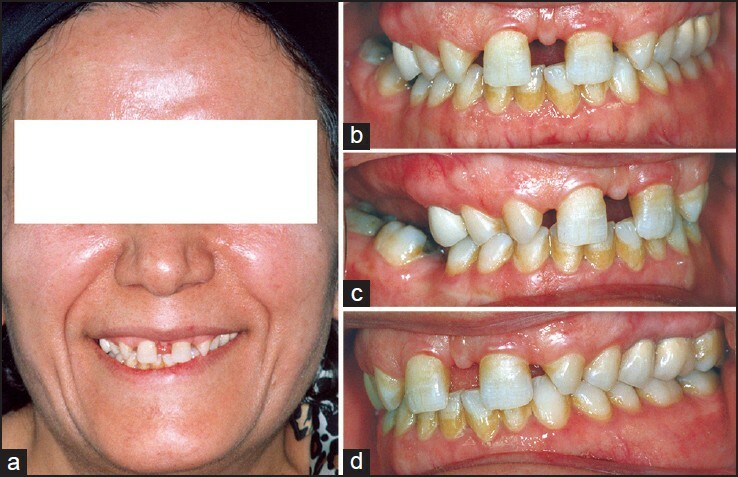 Case Report: The case was a 52-year-old woman with a large median diastema and congenitally missing maxillary lateral incisors. A combined orthodontic and prosthetic approach was used to close the diastema and open up space for substitution of missing laterals by implants. 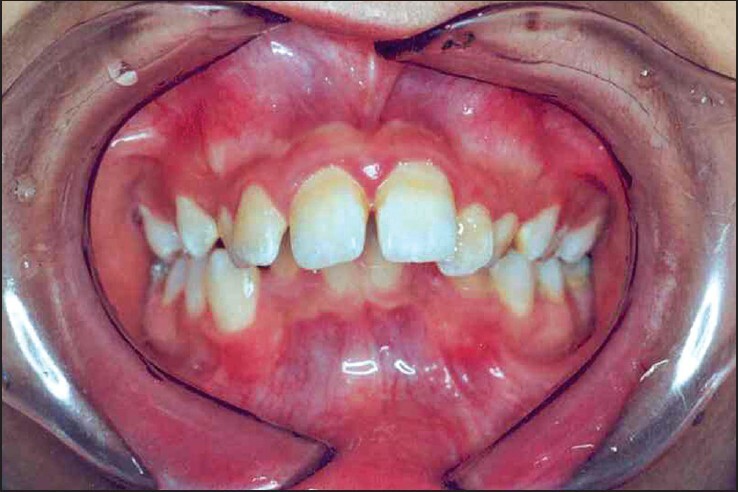 Discussion: Despite the slow rate of tooth movement in adults, a large diastema was closed. This interdisciplinary approach improved the esthetic aspect greatly. The patient was satisfied even after four-years of follow-up period. Introduction: Salivary mucocele is a common benign lesion of the oral cavity, usually presented as a single bluish lesion caused by trauma to the minor salivary gland ducts. We aimed to describe a new combination therapy (micromarsupialization plus intralesional corticosteroid injection) to treat a large mucocele on the lower lip. Case Report: We administered three intralesional dexamethasone (8 mg/2 ml) shots along with standard silk sutures in one-week intervals on a large labial mucocele (primary size: 3.5 cm Χ 1.5 cm) of a 26-year-old man over a three-week duration. Complete healing was obtained three weeks after treatment. A six-month follow-up revealed no signs of recurrence or complications. Discussion: Combination of intralesional dexamethasone and micromarsupialization leads to complete healing of a large lower lip mucocele, and can be considered as an alternative therapeutic method to conventional surgery.